Asset Protection in business and personal planning. Asset protection can be tackled in two main ways. In each case the goal is to make it so that someone coming after you can’t get your assets. That someone coming after you could be someone suing you, the IRS, a former spouse, the medical industry, a bankruptcy, or any other creditor. It doesn’t matter who is after your assets; a little “asset protection structuring” now could make a huge difference when the attack occurs. Asset protection strategies are founded on how you own your assets. Who owns the property and how is it owned? Many asset protection plans use a shell game (don’t worry it is perfectly legal) to protect assets from an attack. If dad is the brain surgeon, when dad gets sued, because he messed up somebody’s frontal lobotomy, all of the assets he owns will be exposed. Even if the lobotomy really didn’t damage Mr. Loboless and actually raised his IQ 30 points, he may get a jury that sympathizes with him, and dad could be in trouble. Not to worry, if dad doesn’t own anything. Assume that the house, brokerage accounts, bank account and all of the other assets are held in mom’s name. Loboless gets his judgment against dad, he can’t get at the assets that mom owns. Mom can’t be drug into the lawsuit mess, because she had nothing to do with poor Mr. Lobules’ new found brain capacity. There simply isn’t a “causal connection” between Loboless and mom. 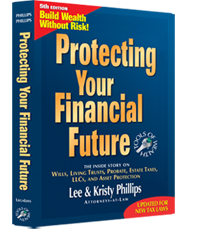 In our book, Protecting Your Financial Future, I go through a detailed true story of a man that got out of paying his creditors millions of dollars, just because he understood the asset protection principles of “ownership.” Yes, I helped him design his asset protection plan. Actually, the property shouldn’t be owned directly in mom’s name. If the properties are held directly in mom’s name, when mom dies, dad will have to probate the house, brokerage account, bank accounts and everything else that mom “owned.” The way around this problem is easy, Have mom “own” the assets in her living revocable trust. The living trust will avoid probate when mom dies. My asset protection system, the Accumulation and Preservation of Wealth, shows you step by step how to set up and then use a living revocable trust. Lots of people get a living revocable trust and they never avoid probate. Just having the piece of paper (trust) isn’t enough. On the order of 90% of the people who pay the big bucks to the lawyers never avoid probate. The other basic asset protection concept relies on statutory protections. Congress has created legal tools that give you asset protection from certain things. The immediate thought most people have is the corporation. The corporation is an asset protection shield that protects the personal assets of stock holders, officers and directors from the activities performed in pursuit of the corporation’s business. This assumes that the corporation is maintained properly and the “corporate shield” can’t be pierced. Over 95% of corporations are vulnerable when they are attacked, because they haven’t been maintained properly. In the Business Planning portion of the Accumulation and Preservation of Wealth Course, corporate maintenance is one of the topics I spend a lot of time on. You have to maintain your own corporation, because you can’t afford to have the attorneys do it for you. Yes, Limited Liability Companies (LLCs), Family Limited Partnerships (FLPs), irrevocable trusts and other statutory tools are available. Each one has a little different asset protection “value.” Which one do you want to use in which circumstance, is dependent on a lot of factors. One attorney will like one in particular and steer all of his clients toward that particular legal tool. He isn’t doing this because the tool is better than the other tools. In fact, in many cases where he uses it, it may not be the best tool, but it is the one he is most familiar with, so it is the one size that fits all of his clients. All of the legal tools have asset protection aspects and tax aspects. The asset protection value of the tool is often at odds with the tax planning value of the tool. I can’t just tell you what the pros and cons are, because it depends on your unique circumstances and what you want to accomplish. I spend a lot of time in the Accumulation and Preservation of Wealth Course educating you on each one of the tools and their pros and cons. It is just as important that you know the disadvantages as it is you know the advantages. 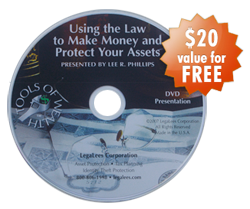 There are a number of legal tools that have almost perfect asset protection. However, attorneys almost never recognize them as asset protection tools. The Employee Retirement Income Security Act (ERISA) extends perfect asset protection to all plan assets. So, your 401(k) is protected. You can’t get sued or go bankrupt and lose it. Remember, they can take away OJ’s super bowl ring, but they can’t take away his pension from the football league. You are limited as to the amount of money you can put into a retirement plan, but there are several benefit plans that have almost unlimited ability to absorb cash. I have seen people put millions of dollars into benefit plans and go through a legal nuclear holocaust and not lose a dime. The Flexible Benefit Plans, Retirement Savings Plans System I have developed makes all of these tools available to you and teaches you how to use them as the ultimate asset protection tools. Section 408 plans are another excellent asset protection tool. The 408 plans are always overlooked by planners. Life insurance policies are protected in most states, and so they make good asset protection tools. Rather than lose huge chunks of cash when somebody is coming after your money, just burry it in a life insurance policy, and the chances are good it will be totally asset protected if somebody comes after you. Yes, you can get screwed by the life insurance companies in a New York minute. You have to know how to evaluate life insurance products, and it’s for sure your agent isn’t going to help you do anything other than buy the policy that pays him the most commission. Get my audio CD entitled Evaluating Life Insurance Policies. I’m not going to sell you any insurance, so I’ll give you the scoop on the policies. You should note that there are several legal tools that do not give you any asset protection, even though they are often sold as asset protection tools. The primary one that is touted as an asset protection tool is a land trust. A land trust may give you some anonymity, but no asset protection. It doesn’t matter if you have LLCs, corporations, or other types of trusts as the beneficiaries, it doesn’t give you any asset protection. Don’t be misled. Obviously the two underlying principles of ownership and statutory protection can be interwoven to provide even higher levels of asset protection, but those plans become complex. I need to give you a word of caution. Don’t go overboard. You can’t stand the complexity in your life that lawyers often want to give you. If it is really complex, that means the lawyer got paid lots of money to set it up, and without paying big bucks on an ongoing basis to the attorneys and accountants to maintain the plan, the plan will fail when it is under fire. I had two doctors call me up a number of years ago. They had paid over $250,000 to an attorney to “establish” their asset protection plan. (Good if you are the attorney. Bad if you are the client.) But, that wasn’t all. They were paying the attorney over $80,000 per year to maintain the structure. These poor doctors call me up and admit that they aren’t going to have anything to protect, because they will be broke if the keep their asset protection plan in place. Actually, I think the attorney had stumbled onto a great asset protection plan. Just give all your money to the attorney, and be happy, don’t worry. If you are broke nobody will sue you. That’s a serious statement. If I don’t own it, you can’t get it.